Reid and Forbes, 1934. Simple cruciform Romanesque church with pitch-roofed nave and transepts, polygonal apse and flat-roofed aisles; linked church hall to NE. Pale sandstone rubble with ashlar dressings. Stone skews. Raised gables to nave and transepts. Flat-roofed porch to SE with ashlar parapet and hood-moulded 2-leaf timber panelled door. INTERIOR: very plain interior with simple arches to aisles. Interesting Art Deco light fittings. CHURCH HALL: pitch-roofed church hall with gable to E and flat-roofed porch with ashlar parapet in matching materials to church. BOUNDARY WALL AND RAILINGS: iron railings on ashlar-coped rubble walls; decorative 2-leaf iron gates. Leaded glazing; sash and case windows to hall. Graded grey slates. 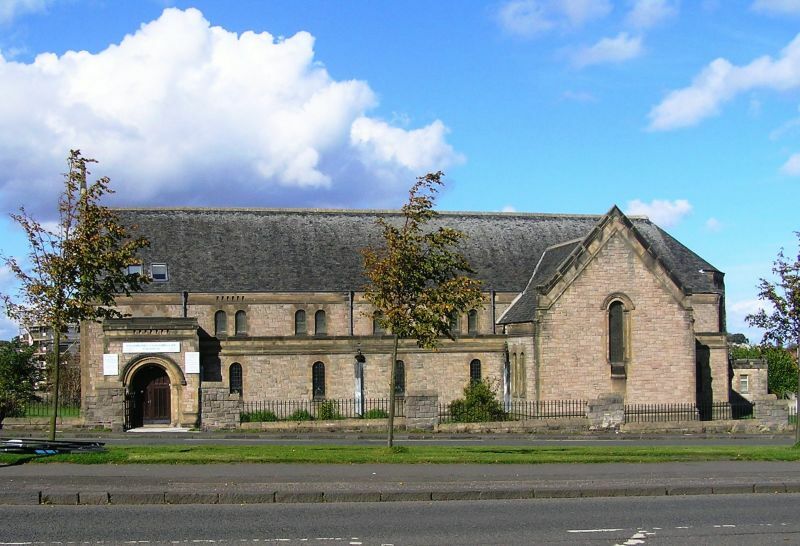 The foundation stone was laid by the Moderator of the Church of Scotland, Dr PD Thomson, on 11th July 1934.